There is always room for improvement! Using this motto, roboticists have taken on the challenge of producing advanced robots with unique characteristics and functionalities. In order to achieve this aim, researchers are employing specialized tools, and building models specially to benefit areas of healthcare, medicine and the rescue operation domain. 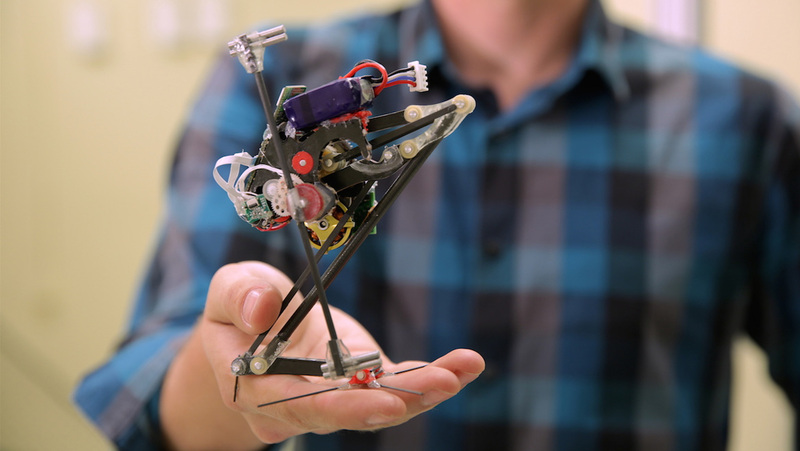 At UC Berkeley, scientists have invented Salto (Saltatorial locomotion on terrain obstacles), an untethered robot that can perform feats of leaping high into the air, climbing walls or hopping continuously as a display of its flexibility and nimbleness. It is now considered the bot with the highest vertical-jumping ability. Inspiration for this design was drawn from the agility, posture and springing tactics of the galago, commonly known as the bushbaby, and results for the robot derived a 78 percent accuracy compared to the animal’s capabilities. This work was published in the Science Robotics journal and supported by the US Army Research Laboratory and the National Science Foundation. The group of researchers developed a metric to gauge vertical ability. This was calculated using the height reached by a single surge into the sky against gravity, multiplied by frequency. They then compared this data to the locomotion of the mammal. The observation made showed that Salto measured up to 1.75 m/s, in parity with the galago at 2.24. In relation to this, lead investigator, Duncan Haldane, mentioned that, “Developing a metric to easily measure vertical agility was key to Salto’s design because it allowed us to rank animals by their jumping agility and then identify a species for inspiration.” Here, in simple words, agility can be defined as how high and how many times the animal or robot can jump. The galago is indeed an accomplished primate in terms of the manner in which it stores energy for movement, instead of depending on its muscles for jumping to great heights consecutively, in what is called power modulation. More specifically, the crouched animal’s flexible tendons accumulate stamina, before releasing it when the galago prepares to leap. Weighing about 3.5 ounces (100 g) and roughly about 10 inches tall (25.4 cm), the robot can typically leap up to 3.2 feet (1 m) in height, but scientists of this study noted that its highest jump was recorded at 3.3 feet. As for wall-jumping, it could gain almost 4 feet (1.2 m). Salto, to replicate the galago’s mechanism, was installed with a spring that when driven by a Series Elastic Actuator (SEA) motor, allows the bot to leap in the air or wall-jump, as needed. The actuators function as a protector to the motor, a force-controller and power modulation. Since the system does not require manual intervention after every activity, jumping can be continuous as long as there is power. To maximize output, a “leg” shaped like a galago’s, with variable mechanical advantage, was built and incorporated, and it was this that considerably improved performance of the robot. Therefore, when the limb is retracted, a low mechanical advantage is seen and, on takeoff, it increases as the leg extends converting large amounts of motion into force. Also, Salto is Parkour-enabled, which means it uses vertical surfaces like walls to complement its actions of jumping at different levels and changing direction, at the same time. The bio-inspired wall-jumping robot, Salto, has already made room for several innovations that could potentially be a product of new and improved general structures and locomotive abilities, addition of more limbs, or polypedal bots, mimicking the motion of other creatures, and so on.